The Yamaha Xmax is a scooter I know very well. No, I don’t own one, at least not yet, but if I get the extra funds to buy one, I definitely would. And for those looking to buy one, I highly recommend that you do it quickly. Prolonging your purchase is just a waste of time. 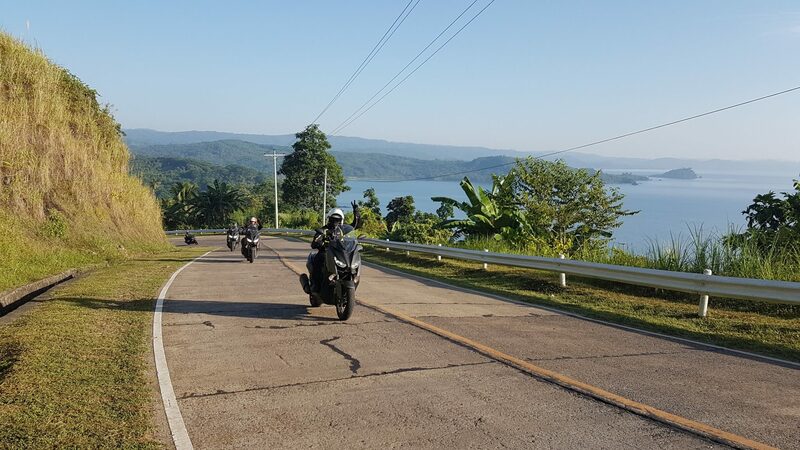 You see, after riding an Xmax 300 for no less than two thousand kilometers around northern Luzon and Mindanao during two epic legs of the Yamaha Tour de Rev ride events recently, I developed profound respect, and intense desire, for the Xmax 300. Here are my top 5 reasons why you should consider the Xmax if you’re planning to buy a maxiscooter anytime soon. 1.POWER – Consider yourself lucky if you don’t live in or anywhere near Metro Manila. That means you’re not affected by the stupid expressway ban on sub 400cc motorcycles, even if the Xmax 300 can easily cruise at the maximum 100 km/h highway speed limit all-day with plenty of reserves for overtaking slow moving traffic. 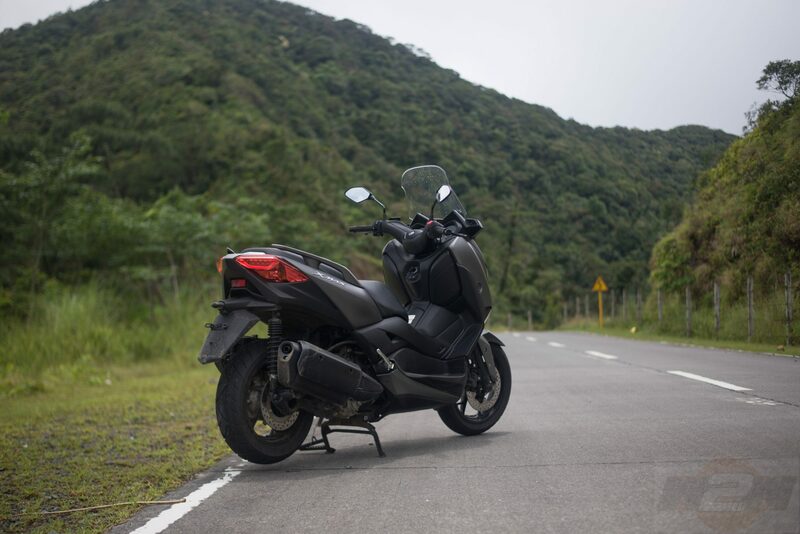 The Xmax is powered by a 292cc liquid-cooled and fuel-injected single cylinder motor rated at 27.63 hp at 7250 rpm and 21.39 lb-ft of torque at 5750 rpm, enough power to propel the Xmax to as tested 150 km/h top speed quickly. 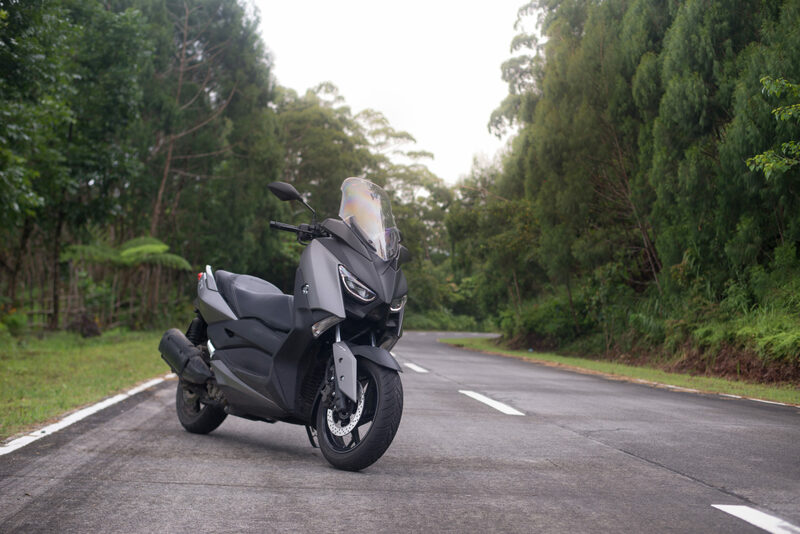 Even if you live in Metro Manila, the Xmax 300 can function as your practical daily commuter and weekend tourer. 2. 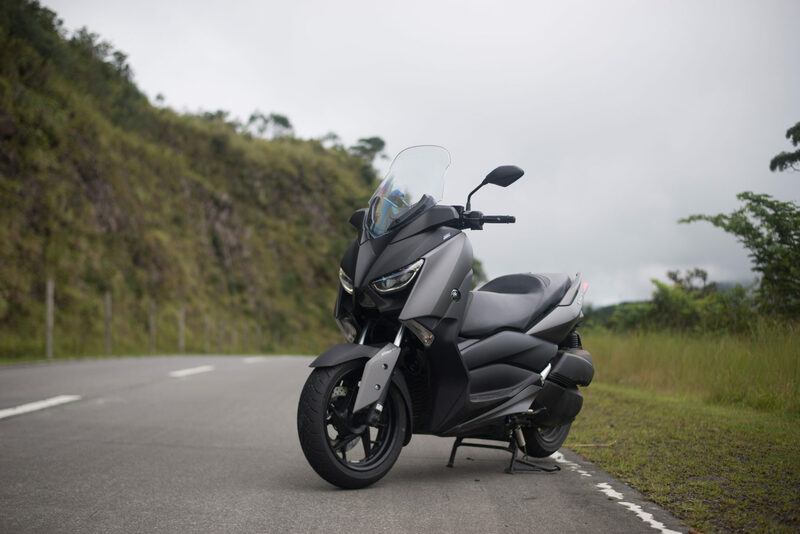 SAFETY – For PhP 249,000, the Xmax 300 already comes loaded with standard safety features like anti-lock braking system and traction control, and both work extremely well. 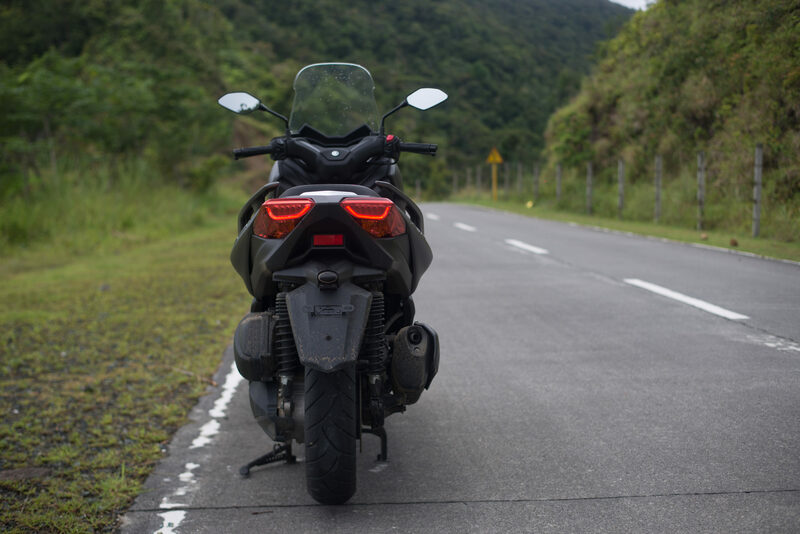 During our rides in northern Luzon and Mindanao, we passed through very slippery roads that if not for the traction control system and ABS, I would’ve crashed. I can’t even remember how many times those safety features saved my skin but I’m sure glad they did. The systems are not intrusive, but they’re also not entirely transparent. 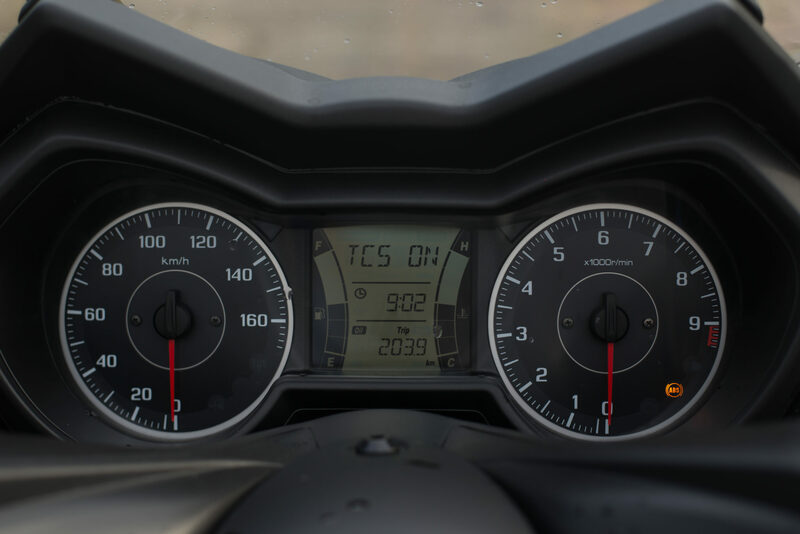 You can feel the traction control system working actively when it cuts off the ignition momentarily when the ECU detects the rear wheel losing traction, and the two-channel ABS are active on both the front and rear wheel disc brakes and they regulate brake line pressure a thousand times a second to prevent the wheels from locking up. 3.HANDLING – For a maxiscooter, the Xmax 300 is not too big, yet it’s not too small either. 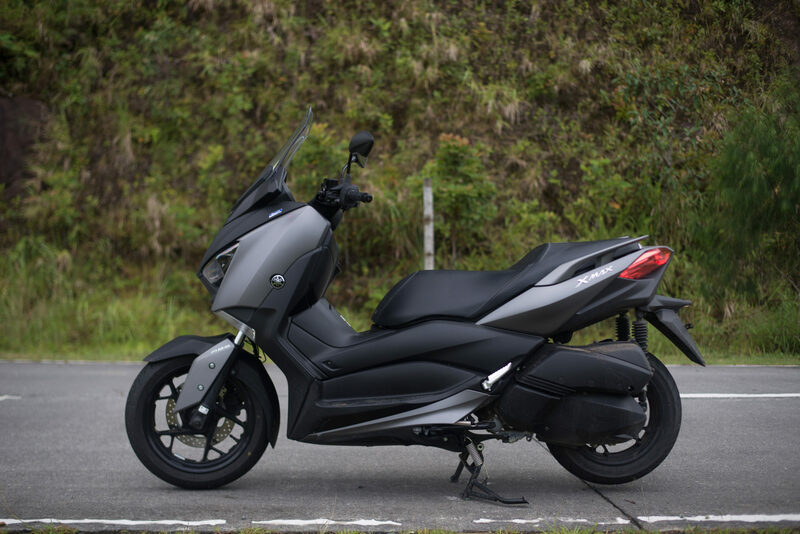 In the Yamaha Max family of scooters, it fits perfectly in-between its Nmax and Tmax siblings. Its medium-size dimensions allow the Xmax to navigate easily through tight city streets while also offering near maxiscooter level of ride comfort and high-speed stability. 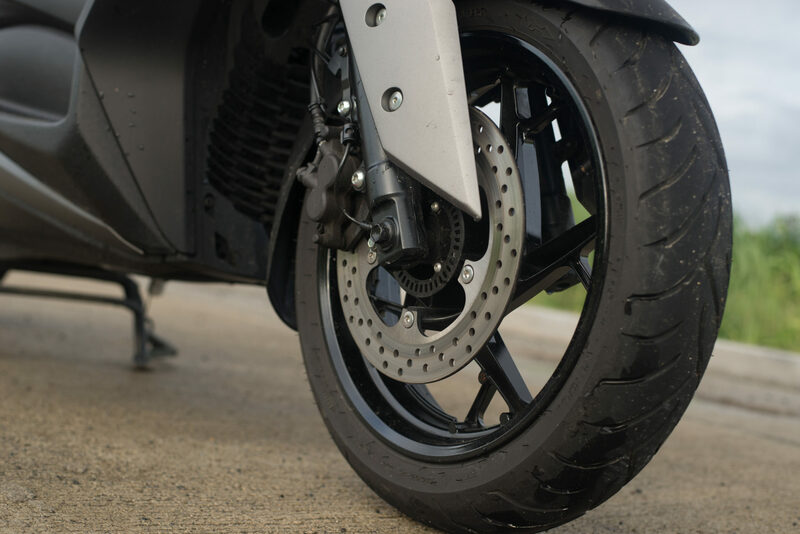 Suspension tuning is leaning on the taut side of comfy but at least it gives the Xmax motorcycle-like agility when it comes to cornering and changing directions. The Xmax rolls on fat 15-inch Dunlop tubeless tires in front and 14-inch in the rear that provide plenty of confidence-inspiring grip in different riding conditions. 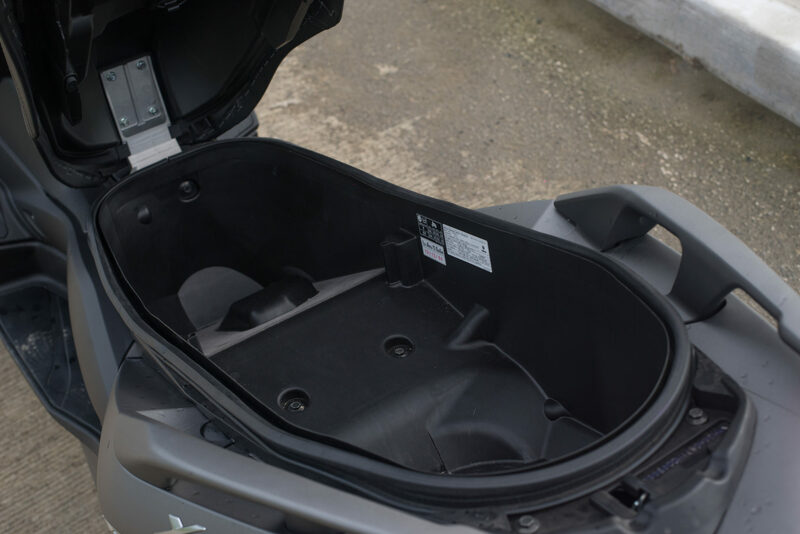 4.COMFORT – Vertically challenged riders may find its 795mm seat height a bit prohibitive, not because of its height, but because the mid-section of the Xmax is a bit wide. But once seated the Xmax provides a roomy and comfortable perch for both rider and passenger. The passenger also gets the benefit of solid grab handles. The riding position is upright with a neutral reach to the tall and wide handlebars. Switches are intuitively placed and where you expect them, except for the trip/info switch where you would normally find the starter button. The starter button, on the other hand, is cleverly incorporated on the large red rocker kill-switch right beside the twist grip. The windshield provides effective wind protection at elevated speeds with minimal buffeting, and it is adjustable. At least its optical clarity is very good allowing you to see through the windscreen as if it’s not even there. Below the windscreen are two elegantly styled analog dials for the speedometer and tachometer. Between them is a large multi-info LCD screen that displays fuel level, water temperature, trip meters, odometer, traction control status, periodic maintenance warning, and clock. 5.CONVENIENCE – Underneath the seat is an LED lit storage bin large enough to hold two full-face helmets and a set of rain gear. Another premium feature of the Xmax is the smart key system. 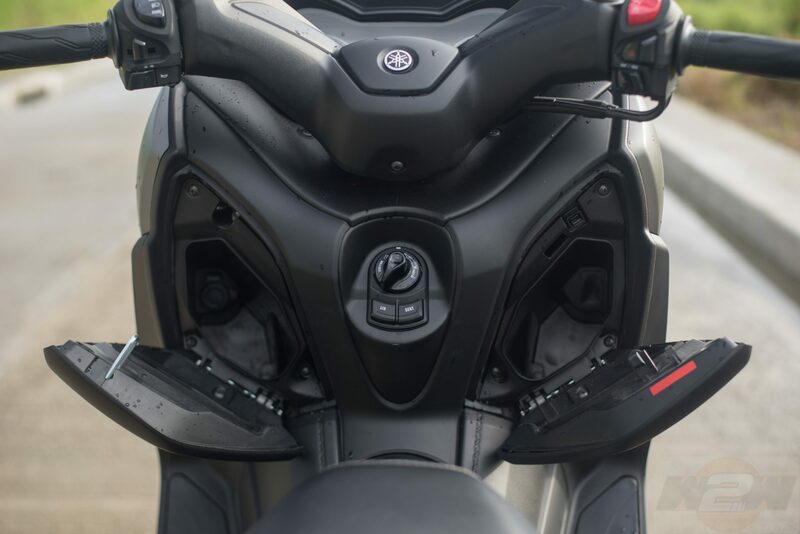 It allows the rider to start the Xmax while the key fob is inside your pocket. 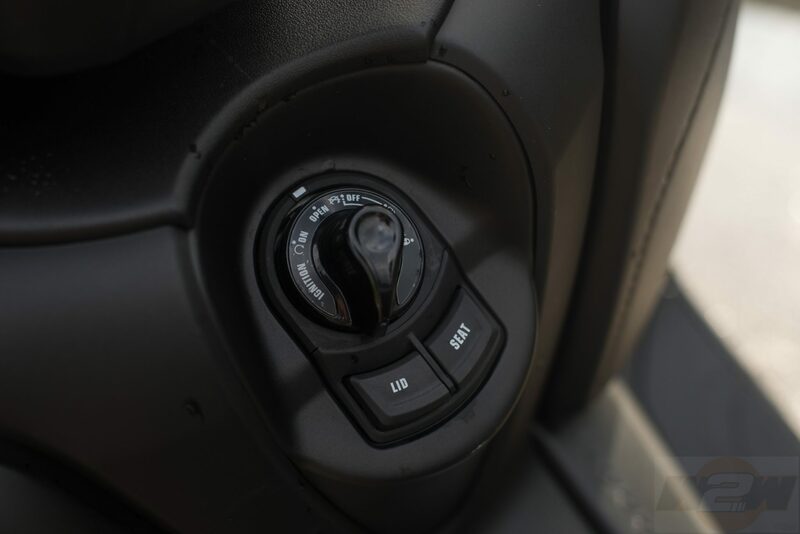 A dial also electronically controls the locking mechanism for the fuel filler lid and compartments. Up front there’s a couple of compartments for smaller items, but take note only the left side can be locked so don’t leave any valuable items on the right side. A useful 12-volt auxiliary outlet can be found on the left side compartment for charging your mobile devices. You just have to provide your own 12v USB adapter. 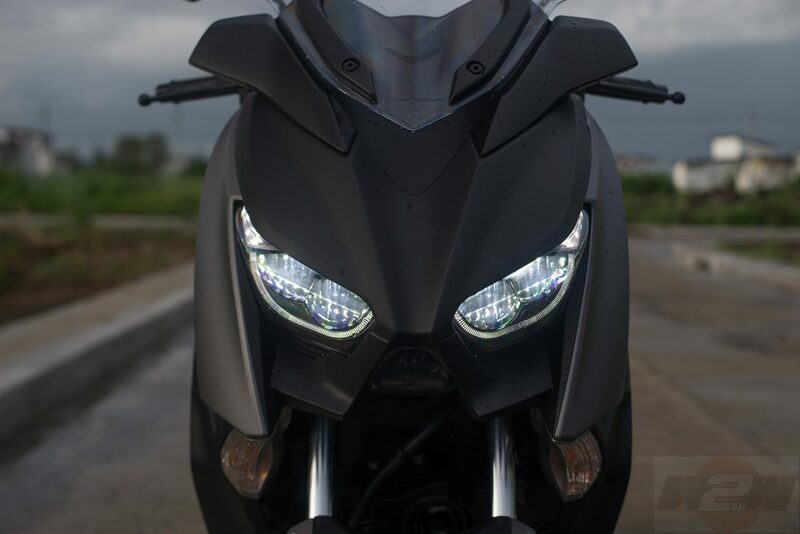 The Xmax is equipped with LED indicators all-around, and unlike some LED setups, the Xmax’s headlights provide powerful illumination at night allowing us to ride with utmost confidence. NITPICKING – As good as the Xmax 300 may be, it’s not without its faults. Actually, they are mere annoyances rather than glaring faults. First, a scooter as big and as heavy as the Xmax should have a hand brake, or at the very least, a brake-lever lock. Anyone who has stopped in an incline to pay for parking or toll knows how difficult this could be while using one hand to hold the brake lever. Speaking of brake levers, these should be span adjustable as well to fit those with shorter digits. Then again, these are just minor irritants that could be easily fixed with some aftermarket parts. If these don’t concern you, then the Xmax could be the perfect mid-size scooter for you. A fast and agile mid-size scooter with plenty of premium features.